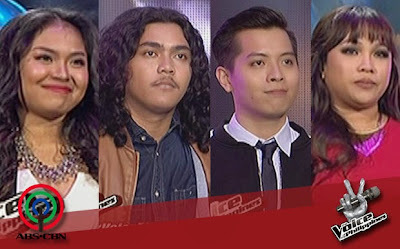 The Voice Philippines Season 2's Top 4 grand finalists have been revealed, after the 2-night semifinals, Feb 21 and 22. The Top 4 heading to The Voice Philippines Season 2 Grand Finals on Feb. 28 and March 1 are 2 girls and 2 boys, just like in Season 1, and even in The Voice Kids. the artists got from the public voting. I feel so sad for Team Apl's Daryl Ong, who only lost by 0.13% to Alisah. He won the public votes, but Coach Apl gave his higher score to Alisah, even though many believe that he should have scored Daryl higher. In his Twitter account, the international singer said that he based his decision on "performance". apldeap: "Tonight was based on performance and it was definitely a hard decision to make. I appreciate everyone's feedback as Daryl is an amazing artist. His journey doesn't end here, it's just beginning. He will always be #TeamApl"
It was also a close fight between Team Lea's artists Timmy and Leah. Now that the Final 4 are revealed, who's your choice to be The Voice Philippines Season 2 winner? Vote in our poll. Which artist do you want to win The Voice Philippines Season 2? Marian the best parin yung mga naninira kay marian may hangganan din. i like marian and dingdong lol, nowadays hirap na magtiwala sa politicians baka kasi yung ginamit ni chiz dito eh pork barrel galing sa tax ko!